I am sure that every parent thinks (and should!) that their child is the most special, adorable and supremely gifted kid in the universe. I am no different and my son continues to amaze me on a daily basis with his kindness, empathy and ability to read. Now, don’t get me wrong – he is still very much a toddler; irrational, moody, dramatic and way too finicky about endless minutia. His thing is that he was an early reader. The recipe was a standard American diet recipe with white flour, white sugar and all kinds of other crap that I don’t keep in my house and try to limit eating in general. So, we made our chocolate doughnuts, which are still a major treat in my book, but with the cleanest ingredients we could. The thing is you wouldn’t know when you taste these. These doughnuts are light, full of chocolate and a bit of palm sugar but not cloyingly sweet. The mini chips in the doughnuts give them textural depth and the chocolate glaze seals the deal! They are phenomenal. 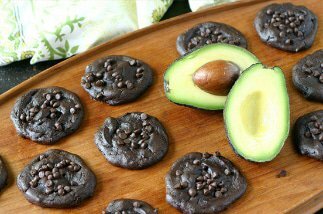 You need to make these ASAP! I used Enjoy Life Mini Chips. They are dairy, soy and nut free. I am in love with Nutiva Organic Extra Virgin Coconut Oil for two reasons – one is that it has a very mild taste and doesn’t overpower my baked goods (or savory dishes) and two, I get the HUGEST tub of it at Costco for about $20. Wilton makes a non-stick, affordable doughnut pan. I got mine at Bed, Bath and Beyond but Amazon has it for pretty cheap (less than $10) as well. These are very nutrient dense so for those of you counting Points Plus, each doughnut is 12 Points Plus. If you want to leave off the glaze and shave some Points, each doughnut would be 10 Points Plus. Still a major treat, I know! Some more great GF Donut ideas: Strawberry Baked Donuts OR Irish Coffee Cake Donuts! Preheat oven to 350F. Lightly grease doughnut pan with coconut oil and set aside. Using a stand or hand mixer, beat eggs with coconut oil and palm sugar on medium speed until creamy. Slowly add in coconut milk, apple cider vinegar and vanilla extract and continue beating until well mixed. Stop mixer and add in sifted coconut flour, cocoa powder, baking soda and sea salt (or just sift right into the bowl like me). Mix until just combined and remove bowl from mixer. Stir in mini chips and scoop batter into doughnut pan with a spatula. Try not to overfill them. You may just a tablespoon or two of batter left over. Bake in the center of the oven for 18 to 20 minutes or until a toothpick or cake tester comes out clean. Remove to a wire rack and allow to cool. Trim with a kitchen scissors if necessary. Mix 1/3 cup mini chips with 1/2 teaspoon of coconut oil in a wide, microwave-safe bowl. Heat for 90 seconds, stopping to stir 1 or 2x, until melted. Working quickly, dip each doughnut (the ugly side that was face up when cooking) into the melted chocolate and place baking sheet lined with parchment or wax paper. Once all of the doughnuts are glazed, place in fridge to set for 15 to 20 minutes. Store in the fridge but remove about 15 min prior to eating to allow the doughnuts to come to room temperature. With that being said, we have eaten them right from the fridge and they are still really good but much better at room temp! Hmm are these supposed to taste more like muffins? I have seen a few hot cross bun recipes made from coconut flour that look like muffins in their pictures. I did use honey instead of sugar, perhaps this changes it. Still they were nice muffins. This is a paleo recipe? You show a photo of Kirkland vanilla extract, it is made with corn syrup. No corn allowed in paleo diets. Hi Denny, I buy the Kirkland Pure Vanilla Extract – the only ingredients are Vanilla Bean Extratives, Alcohol and Sugar. We don’t eat corn syrup in our house. With that being said, if someone wants to eat corn – that is none of my business to judge. I used this recipe and substituted organic butter for coconut oil (ran out of oil) and it was delicious. I also did coconut cream with powdered sugar (not as Palo, but baby steps!) fr the icing. The trick for fluffy cake was not over cooking in the mini donut maker. My kids actually ate something I made that’s paleoish! 🙂 thanks! These were delicious! I subbed flax seed for the eggs and they worked out perfectly. Even my 66 year old father in law enjoyed them! Thanks for letting me know Courtney – so glad the flax substitution worked and everyone loved them! I made this but used palm shortening instead of coconut oil and they were amazing!!!!! Hubby loved them!! Anyone tried subbing in honey instead of sugar? Okay. So these were DELISH. So good and so easy to make, too. The hardest part was greasing the pan and getting the batter in there – which wasn’t hard at all. The only reason I didn’t looove them (and give them the 5th star) is because I was expecting donuts and these tasted more like chocolate cake or, as my boyfriend and his friends called them (when asking for seconds), “those healthy chocolatey brownie things.” That said, if the guys give paleo desserts rave reviews, then they must be good! Thanks for a great recipe! Amazing donuts! My girls ate two each and wanted more. They said they were the best donuts they’ve ever eaten. I must agree. They are divine. Are they really 12 points each though for WW? I was very surprised to hear that seeing that this recipe uses so many natural ingredients. Love it Jennifer! Nothing better than pleasing kids with “healthy” treats. And, yes, they are Point heavy because they are so nutriment dense (eggs, coconut flour, coconut oil, etc.). Natural doesn’t always mean low-fat or light but I think it’s worth it because the fats and protein are all high quality. they WERE dense and lovely…but how most coconut flour recipes I use come out…pleasantly so! Yum, we really enjoyed these! I used palm shortening instead of coconut oil to help convince my kids….thank you! Nice! So glad the kids liked them. Did the shortening make the doughnuts heavy? So glad you liked them Sarah Jane! A heart shape doughnut pan sounds awesome – where did you get it? Hi! This recipe looks awesome, but I was wondering if you think it would work in a donut maker instead of a donut pan? I want to make them for Christmas morning, but don’t have time to buy a pan before then. Did you only use the fat from the top of the coconut milk or did you shake up the can and use the whole mixture? I’m going to make these a seasonal thing for us by replacing the chocolate glaze with a peppermint coconut cream glaze. These sound so good can’t wait to make! I shook the can and used the coconut milk that has the fat included in it. The peppermint coconut cream glaze sounds divine! I made these last night and they came out great! I made two different chocolate donut recipes – this one with coconut flour and another that uses almond flour. This one was the winner. It is thick and moist and delicious. I did two toppings, a chocolate topping (chocolate chips with coconut milk and vanilla) and a vanilla coconut cream with lemon (coconut concentrate, honey, lemon, zest, water). The lemon cream was so good and a nice compliment to the chocolate. Great recipe – thank you for sharing! Yay for chocolate doughnuts!!! I want some now. I love baked doughnuts, these look like such a treat! I will be trying these shortly. How did you get your son to read at his age? I have a son he same age. My husband was an early reader so it might just be genetic. We did do a lot of fun learning games with him when he was a baby but nothing outside the norm. Your son is impressive! He probably reads better than I do! 😉 Although I’ll bet I could eat more of these doughnuts! Really good recipe, fun post – thanks. I think it’s terrific that you’ve got such an exceptional son, and how smart of him to choose doughnuts! I can see he gets it from his mom, because it’s brilliant of you to make a tasty-looking doughnut from ingredients you choose. Chocolate on chocolate action is my favorite. Your little guy is going to keep you very, very busy with his never ending questions. A good thing. I don’t eat donut but this is more like a cake so I may just give it a try. Oh my gosh Norma – he already does!! So many, “Why?” and “How does it work?”s a day – it’s crazy! Alyssa, I am ordering a doughnut pan ASAP to make these…they look scrumptious! What an amazing treat to make, especially with holidays and school breaks coming up soon. And I’m impressed with your little guy’s reading! They are such a treat Hannah – I have been thinking about getting a second doughnut pan and making two batches at a time to freeze some – that is probably overkill but my boys love these! Can I replace coconut sugar with stevia or another natural sugar free sweetener?. I haven’t tried it Kelly so I am not sure if it would work or not – Good luck! These look incredible! I am excited to try them, and also to play with the recipe, because I am a tinker-er. Can you tell me what, if any, other ways you tried this recipe before you were happy with it?